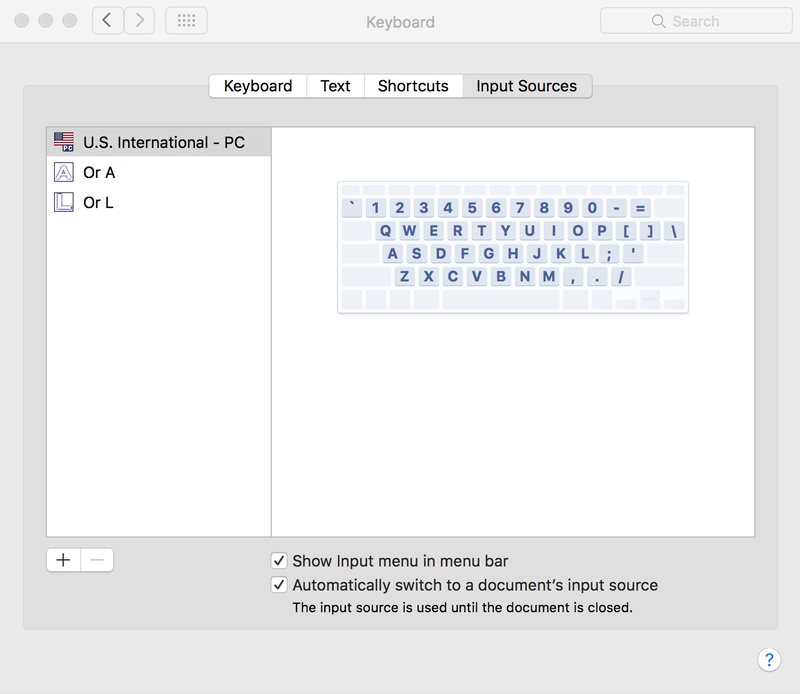 Improved Keyboard Layout for Mac! The Digital Orientalist presents… a new way of painlessly typing Arabic on a Mac! After the success of the keyboard layouts published in 2014, and with the feedback you gave, I developed an improved version of Or A, the keyboard layout that allows you to type Arabic as though you are transliterating. For the moment, the version I offer here is in beta stage and only available for Mac. The previous release, therefore, remains the stable release. Please see that post for a version for Windows and extensive installation instructions. This is a schedule to tell you what character will appear on your screen when you hit a key on your keyboard. For example, when you hit the key on your keyboard that says “1”, on your screen will appear ١. And so forth for all numbers. More important are the letters, of course. Take a look; when you hit “q”, what will appear is the qāf, ق. When you press “a” an alif, ا, will appear. A few letters had to be accommodated differently. ʿAyn is under “e”, hamza is under “c”, etc. When you play around with it it will become obvious (and fuller instructions can be learned from the previous post and will be included in the upcoming full release). So you see that with Shift pressed, you can write the emphatic letters. Shift+s = ص, Shift+z = ظ, etcetera. Also, you can type all kinds of hamzas with Shift. Shift+a/u/i gives that letter with a hamza on top. In the previous version I assigned “o” to be ha, ه, and Shift+o = ة, ta marbuta. I kept it since the ta marbuta is much more common. Writers of Persian do have to use ۀ, a ha with hamza, and they were without an easy option. Now they have it, under Shift+9. Also, before, Shift+x/c/v gave different forms of alif, e.g. with hamza, madda, wasla. I tentatively redesigned this. Now, you can type a top hamza and a bottom hamza above or below any letter. Since alif with hamza on top is so common, I left it in. The alif with wasla moved to Shift+w, which can be remembered by the w for wasla. The madda is now also able to be typed on top of any letter and it is grouped with the dagger alif since both indicate a long ā. They are accessed under “\” and Shift+\. The dagger alif was, before, under Shift+l. Shift+l has now become the money sign, ﷼, memorized through l for riyāl. I am considering moving back in the إ and آ since they are mostly used with alif and in early testing they seem to not do well when searching. Close observers will notice other changes, such as ٯ which before was erroneously under Shift+f. the “f” gives ف, of course, and ٯ is not a fa without a dot, but a qaf without dots, so it has to be under Shift+q. Likewise, the Persian ڤ is now under its intuitive Shift+f. Typing out Quranic text in full mark up has become possible. The Sajda sign is now included under Shift+x. More importantly, a fuller set of vowels is included, with three shapes of the damma: ــُــٗـــٝ. Newly grouped are elongation ــــــ, and shadda, ّ, since both have elongation function (be it orthographic and phonetic). The sukun moved to Shift+0, which is only reasonable as the zero kind of looks like a sukun. Their placement is somewhat random. These are only seldom required but at least it is possible now without taking your hands from your keyboard. A great addition is that you now have full access to Latin script, including simple letters, numbers, and punctuation! This is great for quick words in Latin script, especially useful for typing dates. Pretty self-explanatory. Yup there is a glitch there with Option+Shift+y = ئ. I hope to be able to get it out with the full release. This access to Latin script is very useful, because now you do not have to switch keyboard layouts in the Keyboard Preferences… Menu, but you can simply type it without having to lift your hands from your keyboard. All in all, this version of Or A includes more, is better thought out, and is in general a better experience. Download the layout and download the icon. Open two new Finder windows. Navigate in one to the Downloads folder where the layout and icon are. In the other Finder window, click on Macintosh HD or go to the HD folder in another way. Go to Library. Go to Keyboard Layouts. Copy the layout and icon into this folder. If you had the previous version it will ask what to do, select Replace. Now look at the top-most bar on your screen, on the right. Next to the battery indication there will likely be an indication for the current keyboard. Click it and select Open Keyboard Preferences… (otherwise, go to System Preferences > Keyboard > Input Sources). In the menu, click the + button on the bottom left. Navigate to Others (should be fairly at the top). Select Or A and click Add. Log out of the system ( > Log Out…). Log back in. You are now ready! You can change the keyboard layouts in the menu if you click the keyboard icon next to the battery indication. You can also make a key combination have the layouts switch. Go to System Preferences > Keyboard > Shortcuts > Input Sources and make sure the “Select the previous input source” is selected. Click on it on the right and you can change the key combination. I have set mine to Command+q. Works really awesome. Forget about the US International; you simply can’t delete that one. As long as you only have Or A and Or L, you can keep using the key combination Command+q to switch between them and never be bothered by the US International. So, again, this allows you to switch between layouts without having to lift your hands from the keyboard, saving time and making it more enjoyable to use. Curious about Or L? This is a layout to make transliteration much easier. Check it out here. Bēfōrē yōū ḳnōš īṭ yōū šīll bē ṭypīnġ līḳē ā prō!